Safesorb: Safesorb Is The Safest Fluid Solidifier Because It Is Designed To Be Poured Into An Empty Suction Canister, Before A Procedure Is Started**.Pouring Safesorb Into An Empty Suction Canister Offers Significant Benefits To Hospital Personnel: Safety! It Is Safer To Pour A Solidifier Into An Empty Suction Before A Procedure Starts, Rather Then Opening A Port On The Suction Canister Lid To Add A Solidifier At The End Of The Procedure, When The Suction Canister Is Filled With Liquid Waste. This Benefit: A. Prevents Spilling The Canister Contents While Pouring The Solidifier Into A Suction Canister That Is Filled With Bio-Hazardous Waste. B. Eliminates Employee Exposure To Aerosolized Bloodborne Pathogens By Not Having To Open A Port On The Canister Lid When The Canister Is Filled With Bio-Hazardous Waste; And, C. Reduces O.R. Turnover Time. With Safesorb In The Suction Canister At The Start Of The Procedure, The Canister Contents Are Solidified When The Procedure Is Done. This Eliminates Having To Find A Bottle Of Solidifier After The Procedure, Opening The Canister Lid And Pouring The Solidifier Into The Contaminated Canister, Then Waiting For The Canister Contents To Solidify. 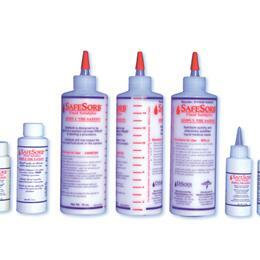 Safesorb Can Also Be Added To A Suction Canister At The Conclusion Of The Procedure. Safesorb Will Not Materially Impact The Fluid Volume Indicated On The Graduated Lines Of A Suction Canister. The O.S.H.A. Bloodborne Pathogens Standard Requires: Minimizing Or Eliminating "Splashing, Spilling And Aerosolizing" Of Liquid Waste.-The Regular Evaluation And Implementation Of Technology That Will Improve This Protection. In Addition, New Federal Department Of Transportation Packaging Regulations Requires The Use Of A Solidifier In An Amount Necessary To Solidify The Fluid In The Disposal Container. Safesorb:-Will Not Materially Alter Indicated Fluid Levels (Like All Competitive Solidifiers).-Solidifies Quickly And Effectively.-Is Available In Convenient Unit Dose Bottles And In A Bulk Bottle. For More Information About Safesorb Log On To: Www.Safesorb.Com*Links To Osha And Department Of Transportation Guidelines*To Quickly And Accurately Compare The Cost Of Using Safesorb *Versus Dornoch, Neptune Or A Solidifier Disinfectant. Twist Cap Lids - Used With Canisters With A Wide Lid Port Solidifies Up To 800Cc’S.